I have no great insight why this would be – a childhood watching Sesame Street and the Muppets, maybe? 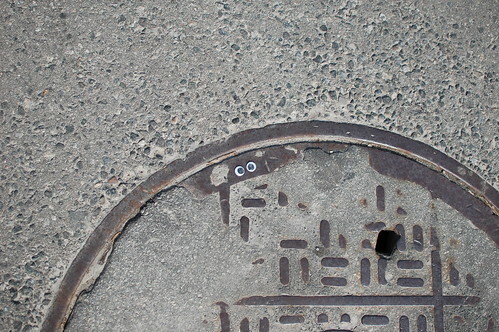 – but for some reason the tiny dose of anthropomorphic surrealism you get from finding a pair of googly-eyes looking at you from somewhere unexpected can turn a rough day all the way around. Thank you, person-putting-googly-eyes-on-random-stuff-in-my-neighborhood. Whoever you are I salute you. I want to be that person in my neighbourhood! That picture just made my morning. I still don’t believe you when you talk about Spring up there though. That’s great. Much, much better than the people who stuck stickers that said “BEEF” on everything in my neighborhood several years back. When you guys get to the “making crafts” stage, like we are, you’ll want to go to the Dollar Store and buy a large bag of these. You can get them in all sorts of sizes, and they have the magical effect of turning any drawing or “monster” or whatever you’re making into something much more significant. We always have a supply on hand for just the reason you mention. This is one of the 4 or 5 greatest references to Jeremy Bentham EVER! Foucault would be proud. Bentham? Probably not so much. Leon Foucault, I hope you mean. And I even threw a Nietzsche reference in there, for those astute few who clicked through. Similar story: shortly after Portal was released, I was walking down the street and some like-minded gamer had drawn the Aperture Science logo in sidewalk chalk. Took me a minute to recall what it was, but when I did it totally made my day.